Whether you are projecting a full screen slide show or using presenter view, you can move the pointer around on a slide to draw attention to a certain idea or image in your presentation. The pointer is set to Automatic, which means it is hidden automatically after three seconds of inactivity. The pointer appears again when you move the mouse. When you are projecting a full screen slide show, the slide show controls are hidden after three seconds of inactivity. Move the mouse to make the slide show controls appear again. 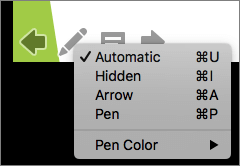 To switch between the pointer and pen, press + A and + P .